What Do Syrian Rebels Think of the Cease-Fire? Fleeing Aleppo with civilians and battered by Russian bombing, ISIS, and Kurdish militias, they have little hope that it will hold. Kilis, Turkey—The first major truce in Syria’s bloody five-year civil war is set to begin on Saturday, following a deal brokered between the United States and Russia. The planned “cessation of hostilities” has emerged as Aleppo, once mostly a rebel stronghold, teeters on the verge of collapse in the face of a Syrian government offensive propelled by heavy Russian bombing. There is little confidence from rebels—increasingly battered by Bashar al-Assad’s army, ISIS, and the Syrian Kurdish forces—that the agreement will hold. The deal is open to all regime and rebel armed groups except the self-proclaimed Islamic State (ISIS) and the Al Qaeda–linked Nusra Front, but it is unclear if it will temper a proxy conflict that has claimed as many as 470,000 lives and left the non-jihadist opposition in disarray. Intense Russian bombardment and the advance of Syrian regime ground forces led by Hezbollah this month has changed the course of the war, cutting rebel supply lines from Turkey and encircling Aleppo city. Abu Mohammad Aziz, the nom de guerre of a commander in the Levant Front, which is fighting in northern Aleppo province, doesn’t believe Russia or the regime will adhere to the truce, which is intended to redirect armed efforts at jihadi forces. “The Russians will continue to bomb us and claim they are hitting ISIS or Nusra,” the battlefield leader in the Islamist-leaning armed coalition tells The Nation. 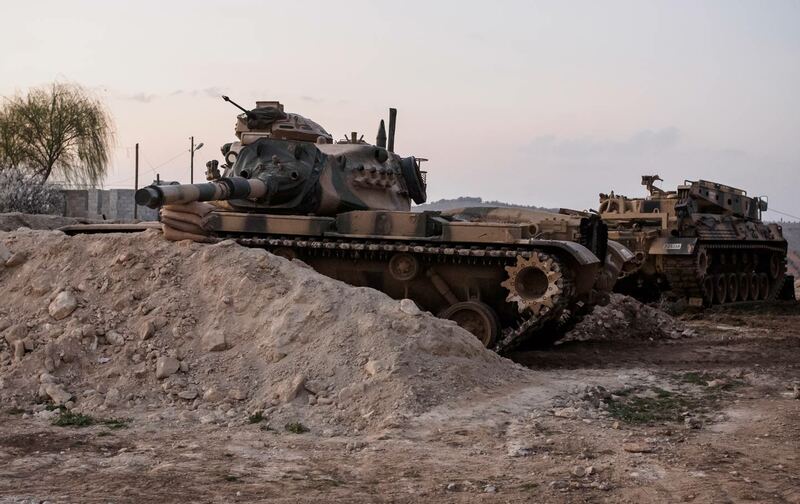 His group has received training from Saudi Arabia and is supported by Turkey but has been losing ground and taking heavy casualties, flanked by regime forces to the south and ISIS to the east. “The regime can’t be trusted,” he says bitterly, about the proposed agreement. He says no decision has been taken by his military and political leadership on whether to sign on to the truce, but he believes they will do so because of the desperation of their situation in Aleppo. The province was a key political, military, and strategic stronghold of the uprising against the Assad regime. As the popular revolt of 2011 turned into a regional conflict, Aleppo became essential for NATO and Gulf countries to supply their Syrian proxies with weapons and other supplies. Now, Abu Aziz warns that Aleppo, Syria’s most populous governorate and its second-largest city, is on the verge of falling, with much of it having been retaken by Assad’s forces and part of it by jihadi groups, including ISIS. His description sounds like an ideal situation for Assad, who in the early days of the revolution released jihadists from government prisons as his regime cracked down on mass anti-authoritarian protests. Since then, Assad has deliberately denied the existence of the popular, non-jihadi opposition and labeled all opponents as terrorists. The Syrian Kurdish nationalist forces, called the People’s Protection Units, or YPG, nominally oppose Assad but have also engaged in hostilities with anti-regime as well as jihadi groups. They have taken advantage of the vacuum created by the Russian air assault to seize border areas. For the Kurds, it is seen as an opportunity to expand their autonomous zones in Syria even as Turkey has started shelling the YPG as its forces advance in Aleppo. At the same time, Turkish government and security forces continue a brutal crackdown on Turkey’s outlawed Kurdistan Workers’ Party (PKK) and the Kurdish population in southeastern Turkey, which are closely allied with but separately organized from the YPG. Despite his skepticism, Abu Aziz hopes the truce will halt the multi-front carnage in his province and open up humanitarian corridors to besieged areas across the country. Still, he notes that the major interest among opposition forces in calming hostilities is the opportunity to regroup and rearm. The hallways of drab Turkish hospitals near the border with Aleppo province provide a small window into the gruesome bloodletting brought about by Russian bombing and the multiple factions at war with one another. 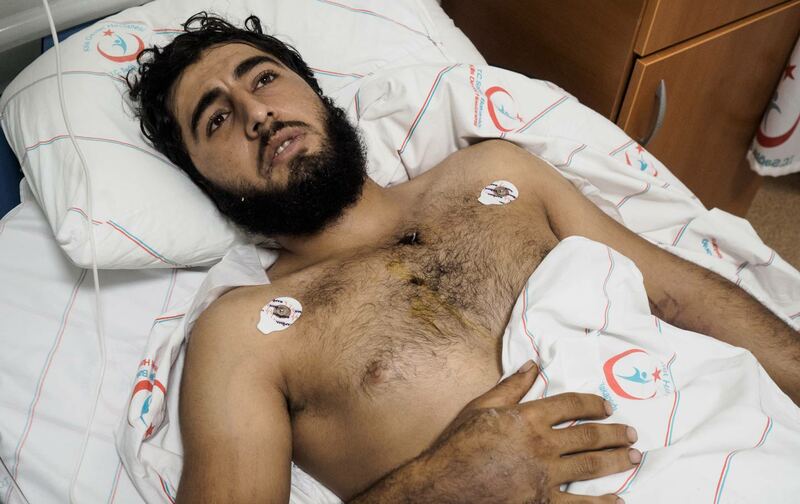 Wounded civilians and rebel fighters alike fill the beds in the main hospital in this border city of Kilis. These people of all ages, filled with shrapnel and bullet holes, are the comparatively lucky ones. They have survived and made it out of Syria. Turkey has already taken in 2.5 million Syrians, more than any other country, but is under increasing pressure from Europe to control its border. It has closed the gates to everyone fleeing the battle of Aleppo, except those needing special medical attention. While tens of thousands remain stranded in border refugee camps close to the fighting, the handful of people receiving medical aid bring with them horror stories from the recent weeks of fighting. Most civilians describe fleeing indiscriminate Russian bombing rather than ground combat. 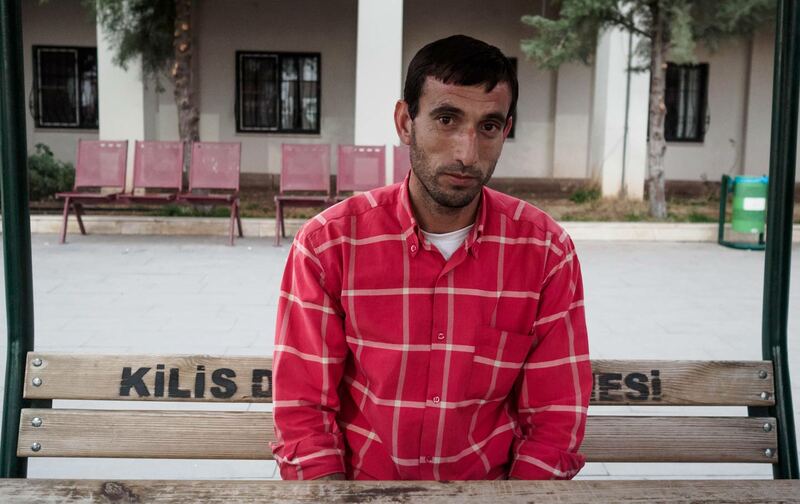 Zachariah al-Sun, 36, sits next to his 23-year-old niece outside the Kilis hospital. Sun fled his northern Aleppo village before the regime advance at the beginning of February and made it to Turkey as a refugee before the gates slammed shut. A Russian bomb killed his brother, while his niece, who declines to give her name, narrowly escaped the bombardment and a YPG ground advance. She was able to come to Turkey for medical attention because she is pregnant and needed an ultrasound; most of her family members are stranded in camps on the Syrian side of the border. Before she was given medical care in Turkey, she was trapped with most of her family in the Bab al-Salameh refugee camp on the Syrian side of the border. She is angry with the Turks for closing the border and calls on Ankara to let fleeing refugees through. “My husband is in the [camp] and couldn’t cross. There wasn’t enough food, tents, or blankets [there],” she says trying to control her frustration. She describes how the collective fear and anger boiled over two weeks ago, when fed-up refugees tried unsuccessfully to break through the border. Zachariah al-Sun blames the Assad regime for his family’s dire situation. “With the will of god we will continue to resist, but who knows, with the current situation,” he says cautiously. Sun’s nephew, 26-year-old Mohammed al-Sun, the son of Zachariah’s dead brother, lies riddled with bullet holes in a hospital bed upstairs. Mohammed, a fighter with the Saudi-supported Fatah brigade, was shot in the back three times during an ambush by US-armed YPG forces amid intense Russian bombardment near the town of Deir Rafat in northern Aleppo. The three stitched-up holes in his chest mark where the bullets exited the exhausted, scraggily bearded fighter, who struggles for every breath. He describes ground fighting between the two opposing forces—armed by close allies—on the edge of town, while the downtown, where the Russians were bombing heavily, had only civilians. “If you don’t die fighting, you die in the bombardment,” he says in a slow, pained voice, depicting the inescapable violence. He, too, has lost faith in the rebels’ ability to hold on to Aleppo, contending that the Russian air campaign and regime ground advance is pushing rebel groups—once united under the umbrella of the Free Syrian Army—to turn on one another. “The FSA is breaking apart,” he says, demoralized. In a parking lot on the Turkish side of the border fence, a handful of FSA fighters and refugees trying to reach besieged family members wait to return to Syria. Among them is a 30-year-old machine gunner with the CIA-vetted and -backed al-Mutasem Billah brigades who calls himself Abu Mohandeseen. He whips out his phone and starts pointing to the different colors on a graphic of a battlefield map to show how his comrades are surrounded. To the west (highlighted in yellow), he says they face attack by advancing US-armed YPG forces. To the east (shaded black), they are clashing with ISIS. To the south (highlighted in red), they are under attack by regime forces. All the while, he says, there is constant Russian bombardment from the air. “The government, ISIS, and the [YPG] are all trying to finish us off before they start fighting each other,” contends the stocky militant. Abu Mohandeseen describes how his unit, which received US training and weapons primarily to fight ISIS, now finds that it is locked in a losing battle with both other US partners and Assad’s forces. Abu Mohandeseen also says that he has seen Russian ground troops in Syria and heard them on the radio. Although Russia is officially only engaged in an air-assault campaign, in January, Hezbollah commanders said that Russian special forces had boots on the ground in the northwestern province of Latakia. Fifty feet away from where Abu Mohandeseen explains the details of shifting battlefield alliances, a handful of middle-aged men anxiously wait for permission to return to Aleppo. 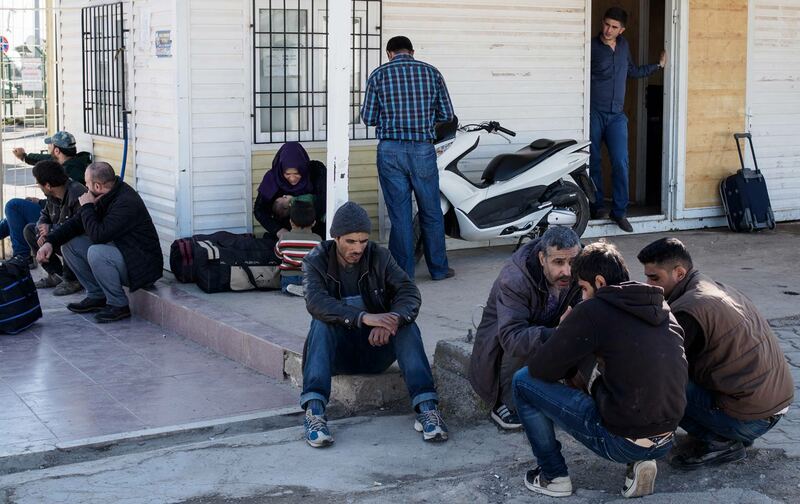 Some have recently recovered from war injuries in Turkish hospitals, while others have been in Turkey for years. What unites these civilians is their determination to save loved ones trapped by the fighting or starving from siege—and they are about to navigate an internationally funded circular shooting gallery to do so.